A leader in the robotics business for 35 years, Acieta provides a wide range of robotically automated solutions and services for the manufacturing industry. With locations in Pewaukee, Wis., and Council Bluffs, Iowa, Acieta has integrated more than 4,200 automation systems for customers across the United States, Mexico and Canada. As part of its mission to be a true partner to its customer base, Acieta is committed to solving challenges facing all manufacturers, such as lowering costs, increasing productivity and addressing labor shortfalls. Serving most manufacturing segments, Acieta has 130 employees across the United States and is committed to creating a positive future for North American manufacturing. 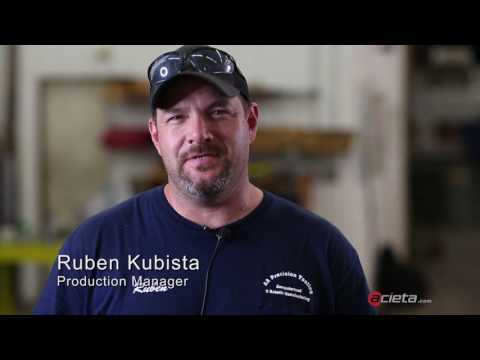 Acieta is committed to creating a positive future for North American manufacturing. Wholly owned and backed by the strength of Mitsui & Co.
Acieta holds industry certifications from FANUC and the Robotic Industries Association.